YOUR HUNT MAY BE DETERMINED BY THE QUALITY OF YOUR TIMER. Easy to Operate 5 YEAR WARRANTY. Compatible with any 6 or 12 volt control unit. Can feed up to 6 times a day. Each feed time can be for different duration. 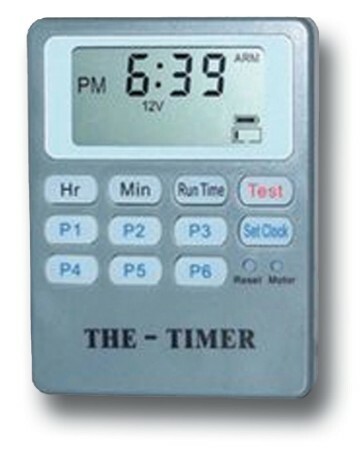 Timer runs on main battery when hooked up to it. Fuse protected - blown fuse indicator. Built-in battery level indicator. Easy 4 wire hook up, 2 to battery, 2 to motor. Push button reset. Larger buttons - lighted display when setting the time.